has hit a high note with new residential projects which see the transformation of key sites in Fitzroy, 231 Smith Street and George Corner. Completed in November last year, 231 Smith Street a $14 million, 500 square metre development is located on level three of the historic building and comprises 15 one and two-bedroom warehouse-style apartments. It is Fitzroy’s first major air space development, sitting atop the Panama Dining Room building which was originally constructed in 1903. The development’s raking frame, rolled-over metal-clad roof, tall dormer-style windows and Juliet balconies combine to make the development rise seamlessly above the historic façade, which has been returned to its former glory over the past 10 years by Neometro. Director of Neometro Jeff Provan said the development is a lesson in subtlety and marks Neometro’s first foray into heritage redevelopment. “Heritage redevelopment can be challenging but we couldn’t help but recognise this building’s great bones and the potential of the area, which is coming of age. Fitzroy and Collingwood continue to be in high demand as places to live, play and work and we don’t see that changing,” he said. “The 231 Smith Street apartments echo the creative and industrial feel of Fitzroy and aim to pay homage to the area’s heritage but also exist as a tribute to the revitalisation of this once manufacturing heavy suburb". Neometro's newer George Corner development will see the construction of a $29 million mixed-use development starting in February 2014. 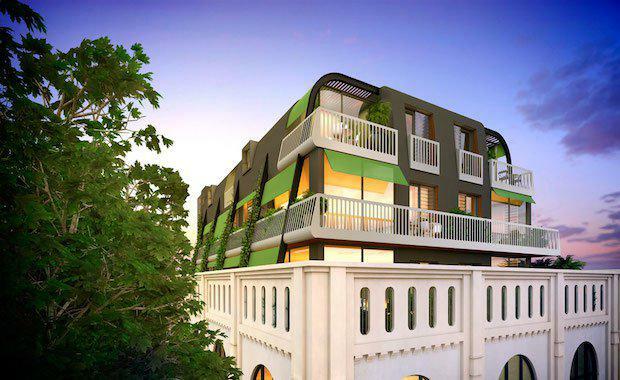 On the corner of George and Argyle Streets in Melbourne's Fitzroy, the 770sqm development over six levels will comprise one and two-bedroom residences that range in size from 40sqm to 92sqm with prices ranging from $380,000 to $930,000. The ground floor will feature two retail spaces for cafés or restaurants. Each apartment will feature either a terrace or balcony with a tranquil central courtyard at the rear of the building that acts as a light well, providing ample space and light for the western-facing apartments. Mr Provan said Fitzroy was becoming the cultural epicenter of Melbourne with local residents who demanded cutting-edge design and creativity in all aspects of their lives. “We have been in the area for a long time and intend to continue our involvement by finding new sites and contributing to the local community in new and creative ways,” he said.